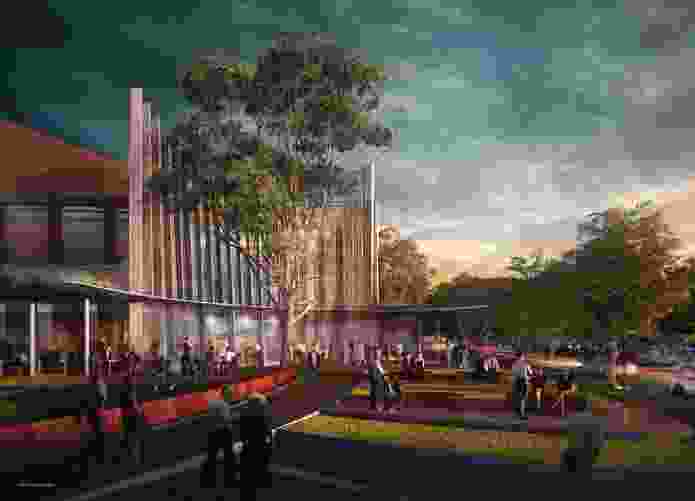 Proposal for the refurbishment of the Sutherland Entertainment Centre by Chrofi and NBRS Architecture. The Sutherland Shire Council has release three shortlisted schemes for the $21.8 million refurbishment of the Sutherland Entertainment Centre in Sydney’s south, after seeking expressions of interest from designers in November 2018. 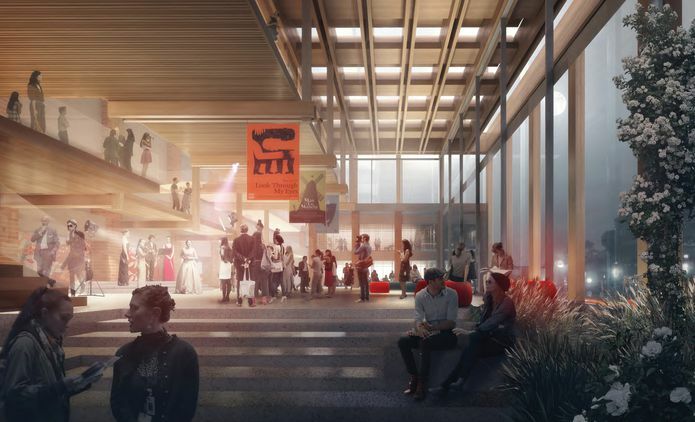 The project intends to modernize the 40-year-old facility with a reworked theatre, a new foyer, enhanced accessibility as well as a refreshed forecourt and backstage facilities. Proposals from Cox Architecture, FJMT, and Chrofi and NBRS Architecture have been shortlisted by the council. Chrofi and NBRS Architecture have proposed a foyer addition that would act as both a “verandah” to the existing building as well as a “pergola” in the landscape. 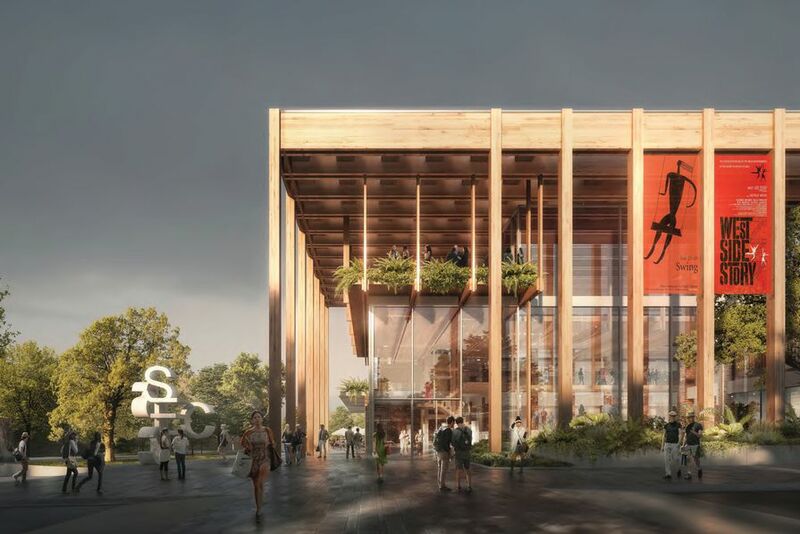 “This relationship can be one where the entertainment and what goes on within begins to feel like it is much more a part of the park, and [simultaneously] the park should also feel that it is an extension of the building,” said Andrew Lamond, senior associate of Chrofi. Proposal for the refurbishment of the Sutherland Entertainment Centre by Cox Architecture. Cox Architecture’s proposal centres around an existing gum tree on the site, which will become a “meeting tree” and a focal point of the complex. 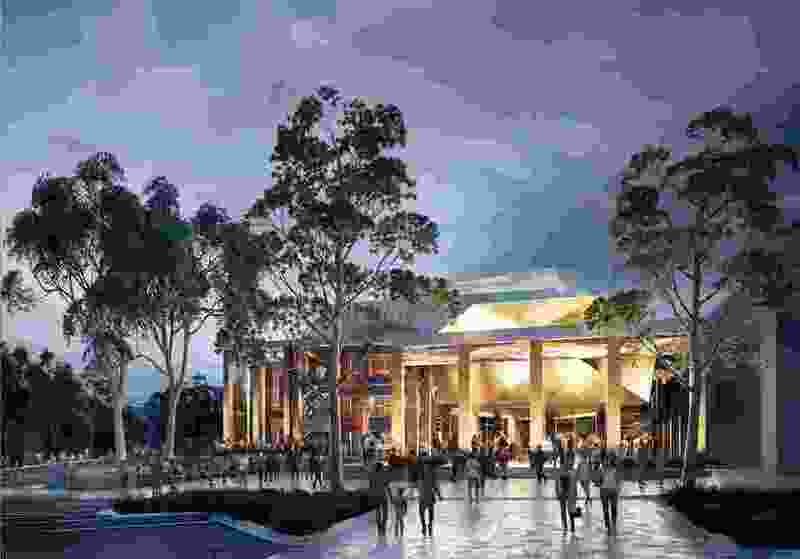 An awning will guide visitors to the meeting tree and a series of landscaped terraces will provide gathering spaces. A triple height foyer space will be inserted internally to connect all levels. 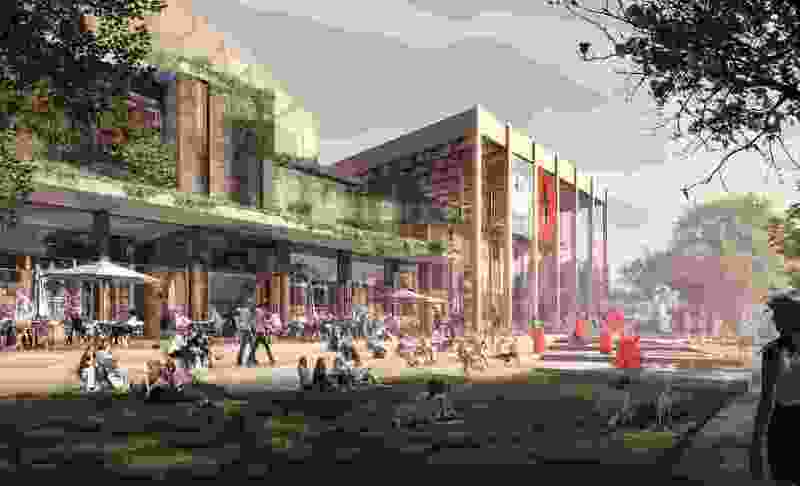 A cafe on the ground floor will spill out into the foyer and the adjoining Peace Park. 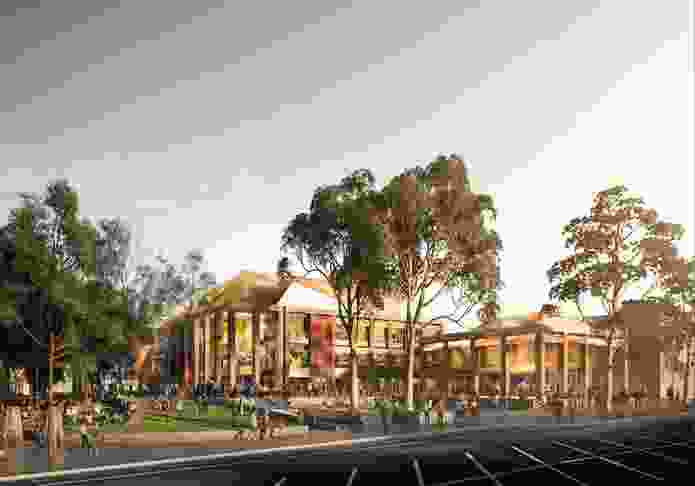 “The material palette reveal the textural richness of the shire’s unique landscapes and celebrate place. Textures and colour have been selected to reflect the shire’s natural beauty and in particular the welcome tree. 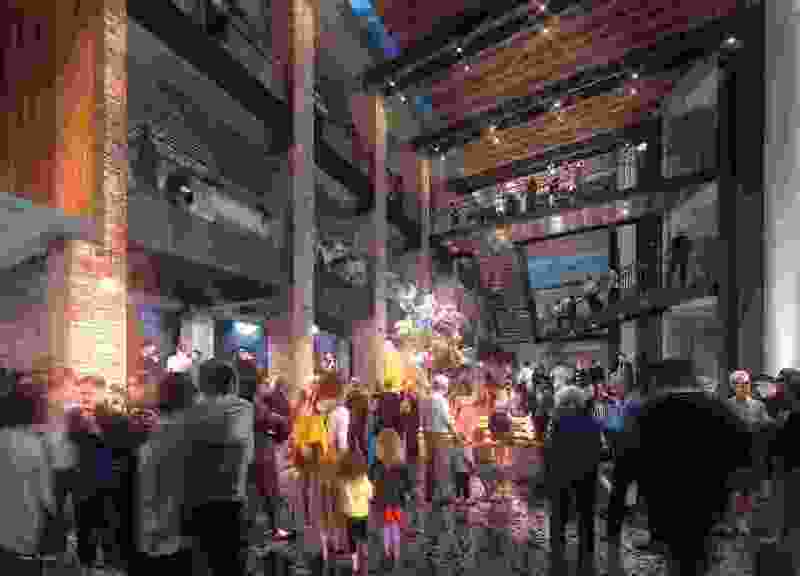 The interior palette is accented with playful yet robust finishes, capable of dealing with the wear and tear of public life,” said the design team. 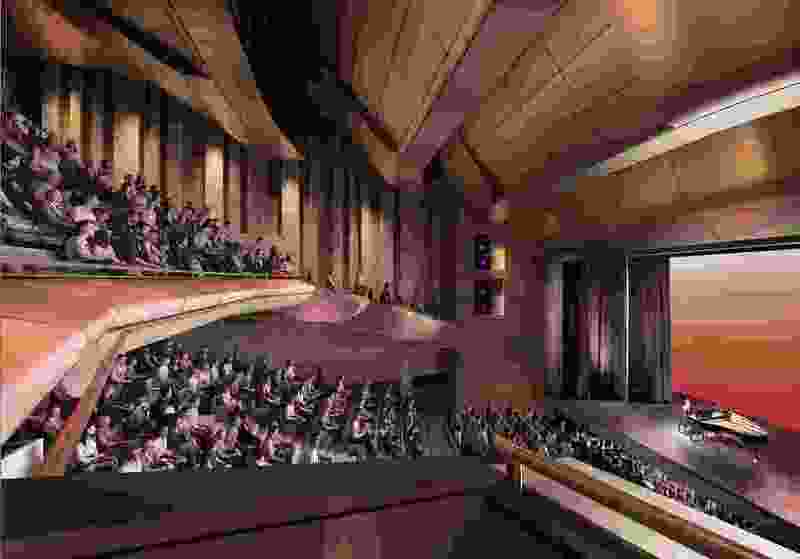 Proposal for the refurbishment of the Sutherland Entertainment Centre by FJMT. 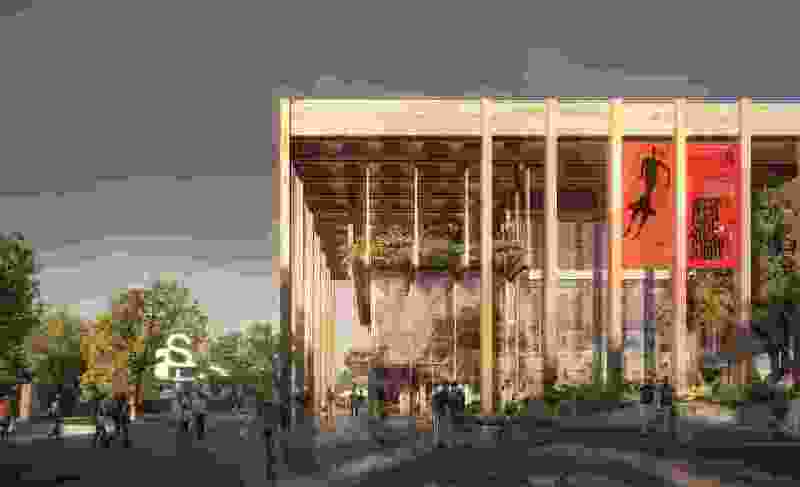 The proposals are on exhibition for public comment until 3 April 2019.